Many of us love visiting art museums and galleries, but how often do we get the opportunity to slow down, take a closer look, and really engage with what we're seeing? This interactive tour is designed to encourage just that, all while you enjoy the atmosphere of three exciting Santa Fe art galleries. We'll conclude the tour with a chocolate elixir tasting at Kakawa Chocolate House for a truly sensory experience. We'll kick off our immersive tour at Nedra Matteucci Galleries, a landmark Santa Fe art gallery. 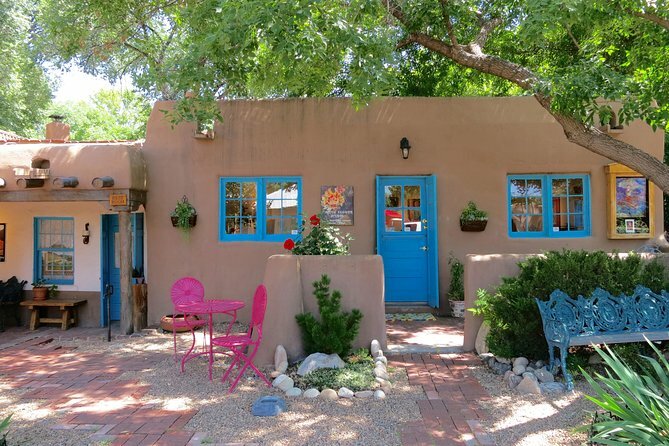 Housed in a beautiful, sprawling historic adobe building, Nedra Matteucci Galleries specializes in work with a Southwestern flair by modern and contemporary New Mexico artists. There, you'll discover artwork by notable local artists, delve into the work on view through a fun and insightful technique for art interpretation, and visit a gorgeous sculpture garden. Next door, in an impressive and airy gallery space, Peters Projects features a range of fascinating artwork by local and international cutting-edge contemporary artists. We'll take a closer look at the methods and media these artists use and the concepts that inspire them. After exploring the current exhibitions at Peters Projects, we'll head to Canyon Road, Santa Fe's historic arts district and home to over 80 galleries. Take in the unique ambiance of this art district as we stroll to our next gallery. Our final gallery stop is Pippin Contemporary, a cozy gallery on Canyon Road that celebrates color. Through fun prompts and conversation, we’ll explore messages and meaning in the artwork on view, pinpoint what we personally connect with, and uncover what we value about art. To conclude the tour, we’ll visit Kakawa Chocolate House and indulge in tantalizing chocolate elixirs that stimulate the senses with unique combinations of herbs, spices, and fine drinking chocolate. Once you've selected your favorite flavor, we'll continue the conversation while enjoying the Kakawa elixirs of our choice. Chocolate tasting and one small chocolate elixir for each person is included in the price of the tour. We will walk approximately 3/4 of a mile. Please wear comfortable shoes. Families with children under 10 years should contact us directly before booking. Customers with service animals and/or mobility restrictions should contact us directly before booking. Not recommended for travelers with mobility restrictions. Please contact us directly for other tour options.